You have to hand it to Terraplane Sun…it isn’t often when a “mere” six-song compilation of sound damned near perfectly captures and encapsulates a band’s esthetic, yet doesn’t hold it hostage to the point where little else is expected of them. The Venice Beach, CA quintet is noted and notable for sounding like a rock band with a hard jones for folky country and rocking blues. Yes, every song on Friends has been thoroughly fleshed out in the live arena to the point where anyone who has seen the band on tour within the past six months has heard them. The good thing is that now you can actually own them and, yes, you want to. Friends works because it weaves an immediate palette of their distinct sound from the very first track and that sound sets them apart from the other 5,000 bands in the Los Angeles area. With all of the grooves and hooks that are embedded within (and it’s very easy to mentally latch on to a Terraplane Sun tune), what never gets lost or watered down is their penchant for soul, blues, full blown musicality, and refined rawness. Their bluesy eclecticism, keys, trombone, and Ben Rothbard’s angular vocals in “Ya Never Know” creates a slinking tread through conflict where the same formula (plus a little mandolin) in “Tell Me I’m Wrong” pops with freshness and attitude yet maintains a folky rootedness. The urge to dip into thicker, swampier waters as on the title track isn’t a surprise, but is an accomplished example of Terraplane Sun’s range and high marks go to producer Dave Trumfio (My Morning Jacket, Wilco) for his focused heightening of their lo-fi and vintage sound. Even the single “Get Me Golden” wields that ’60s dance hall air of Motown and aged organ making it close to an irresistible piece of pop-centric rock with a shiny layer of California sun. 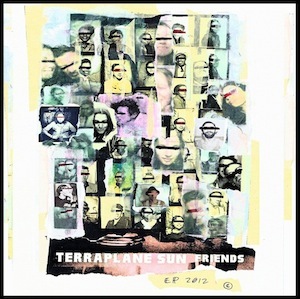 After the EP has run its concentrated course, you’ll have a full grasp on how uniquely and how well Terraplane Sun rolls because Friends is one of the finer offerings from one of LA’s finer tuned bands.